The City Apparel Team had the privilege of attending the Promotional Products Association International (PPAI) Expo this year. The PPAI brought more than 12,000 distributors from over 4,000 companies together for a 5 day event. There were many events sponsored by PPAI which included meetings, sessions, seminars, and much more. PPAI is aiming to provide a platform for suppliers and distributors to make long lasting connections in their industry. By attracting these innovative solutions and producers in one place, this makes this experience single handedly the most important event of the year. The 16 oz. 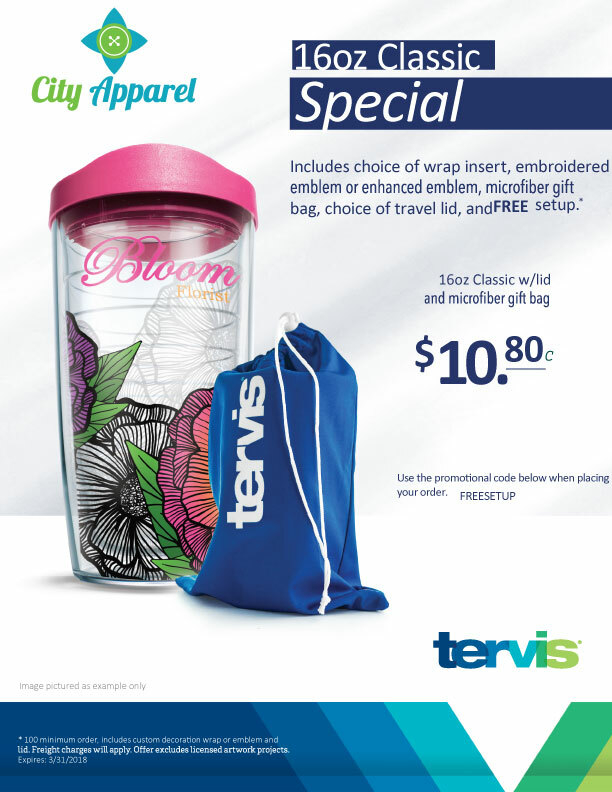 Tervis Tumbler, is an up incoming industry favorite for 2018! This item is on SPECIAL through the end of the 1st quarter. This product gives you the option to choose your lid color as well as the decoration on the tumbler. Contact your City Apparel account solutions mastermind with any questions or further information! Be sure to use the reference promo code FREESETUP when placing your order, to receive this AMAZING offer! What better way to kick start an event than a custom 3D-molded popsicle. A highly recommended product for all kids, outdoor, 5K races, or just a “You’re doing a great job, treat”. It comes in 4 different flavors; Strawberry Lemonade, Green Apple, Blue Watermelon Citrus, and Watermelon Citrus. It also is available in a smaller version, better known as the POPtail. This product is unlike any others we saw in Vegas and will allow you stand out from your competitors! Feel free to contact City Apparel for any general questions regarding these new products! Personal Shopper. It's a Thing!